I installed the Solarcity Internet monitoring system base station by plugging it into a spare Ethernet port on my DSL modem. It flashed some lights that told me that it had connected to Solarcity successfully, then started scanning to find the monitored devices. It talks to the inverter to track how much power is being generated, and I will have an optional consumption monitor that tells me how much power the house is using. I have to wait for the install to be complete before I can see any output on the solarcity.com web site. Also, they were out of stock of the consumption monitor, so it will need to be added on later, but it doesn't affect the operation of the system. I have also figured out the Ground Source Heat Pump, I'm going for a vertical well based installation, its a 3-ton A/C unit and heater made by Carrier that hooks up to my existing propane furnace ducting, and includes a water heater that replaces my propane hot water tank. It exchanges heat with the ground using three 200ft deep wells, and for every KW of electricity it uses, it pumps around 4KW of heat in or out of the house. This is over twice as efficient as a conventional air based A/C unit. It costs more, but there is a 30% federal tax credit on the full price, just like the solar power installation, thanks to Obama's stimulus package (this credit started in February 2009). 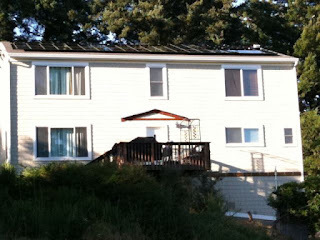 I'm hoping to have enough solar power to zero out the running costs, we will see how that goes over time. 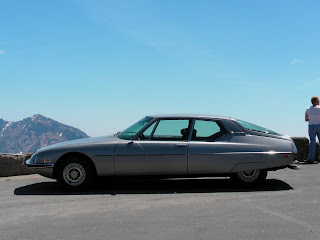 I go to the Monterey Historic Races every year, and this year I'm also taking my Citroen SM to a new event La Dolce Vita Automobili - it's set up to be a smaller and more fun alternative to the Concorso Italiano, which is on the same day Friday August 14th. Here is the SM at Crater Lake a few weeks ago. Today about half the panels were put in place on the roof, and a lot of wiring was put in place. 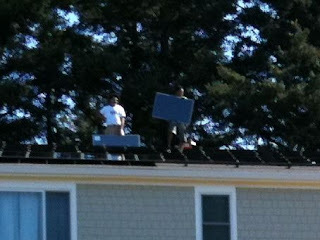 Here are the installers starting to put panels in place in the morning. In the evening the lowest row of 20 are in place, and about half of the next row. There will be a total of 60 panels when it's done. 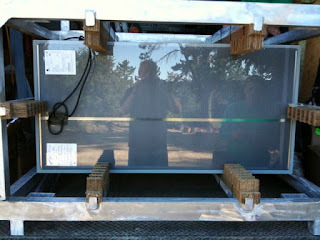 Here is the underside of a panel, in a shipping rack on the truck. A closeup of the panel's specification label, as I mentioned before, its a Cadmium Telluride CdTe thin film technology panel from First Solar. Each panel is rated at 75W, and the total installation is rated at 4.5KW. More mounting hardware is now on the roof, the brackets that hold the panels to the rails are now in place. Since the PG&E meter isn't mounted on the house itself, they also had to dig a trench. Tomorrow a county planning dept. inspector will come by to make sure everything is to code. 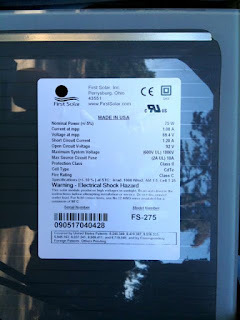 I also got an email from PG&E today, informing me that they know I have solar being installed and will schedule an appointment to do their own verification and turn the system on, once the hardware is in place. 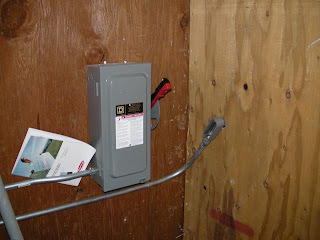 The generator is only wired into a subset of the house circuits, so it is looped into the house breaker panel. When installed, it will have a sensor that can tell whether there is any incoming power from PG&E, and if not, it fires up after 20 seconds or so. The solar power system detects the PG&E power, synchronizes to the 60Hz phase and adds its own power by providing a few volts more than PG&E, to get the power to flow into the system. If PG&E goes away, the solar system also shuts down, then the generator detects no power, isolates the downstream components and takes over powering the house. At one point I looked at having batteries rather than a generator, but it is a lot less efficient, they don't last very long and they are far more expensive. A 6KW battery system with inverter was around $10K, while I can get a 8KW propane generator for $2K, and I'm thinking of putting in a 14KW Generac 5503 that is currently available from Amazon for $3.3K delivered, since that can supply a 40A 220V circuit for the heat pump. I'm likely to need it for up to a week each year, and that will be the only thing that uses propane at that point. Here's the house, showing the mounting points and rails on the roof. 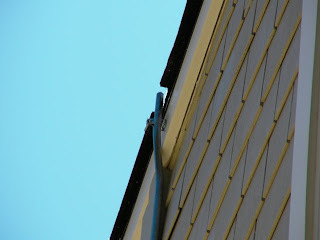 Top end of conduit at the roof line. Bottom end of conduit at the basement level. 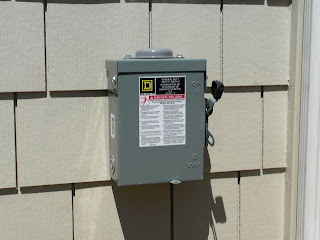 Bottom end and A/C shutoff switch on the front of the house at basement/ground level. A/C shutoff switch. 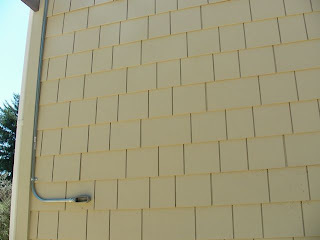 Safety rules mandate that this is easily accessible on the outside of the house. Inside the basement, showing the connection to the back of the A/C cutoff switch on the right. In the middle is the D/C cutoff switch that has the conduit from the roof routed to it. There will be another D/C shutoff switch on the roof itself, again for safety. 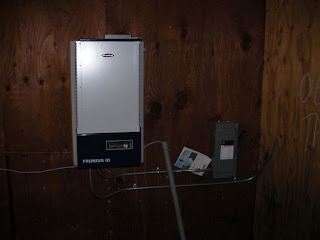 This is the inverter on the left, and the D/C shutoff switch on the right. 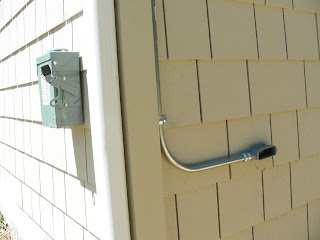 The pipe coming up carries the phone line into the house. 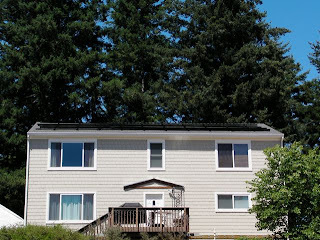 The plans were approved earlier this week, and Solarcity called me on the phone and emailed to setup an installation time, which I was able to arrange very conveniently via email. The assigned installation team are finishing up another job, then I'm next, starting tomorrow (Friday 24th July) for a few days. There has been nothing to show so far, but I will be taking pictures and posting them. Steve Souders writes a good summary of the Velocity Conference. I'd like to present something next year, I have a few ideas already, and have been inspired to try some latency testing projects at work.